An apple a day doesn't just keep the doctor away, it can also improve memory. From eating the right foods to knowing the right exercises, becoming smarter isn't always about textbooks and tests. 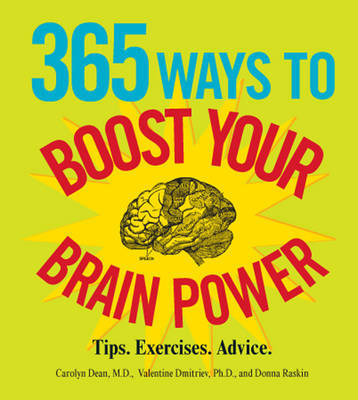 With this practical, interactive guide, you can amp up your IQ in no time! Filled with 365 tips and tricks to better the brain, you'll learn that: Gingko Biloba increases blood flow to the brain learning a new language improves brain function classical music will help your problem-solving abilities sitting up straight doesn't just elevate your body, it improves your thinking process taking a brisk walk builds a better connection between brain cells eating at least one cup of blueberries a day reduces the effects of Alzheimer's disease or dementia and other brain boosting facts! This book is all that's needed for smarter living-starting now.